So, I got a new webcam from Logitech webcam 9000, which came in a nice green and black box, and inside came the webcam (1.6H x 3.5W), the user manual and installation CD. The installation asks some simple questions and you have a choice of creating an account for voice chatting, plug it to a USB port and you're done. Very simple! The setup does a self test and tunes itself. I have had other software where I had to mess with the setting so much just to get it right, but this was ready to roll 5 minutes after I opened the box. 1st - Logitech Vid is the video phone that’s with the sign up (free) and you can talk with other friends. 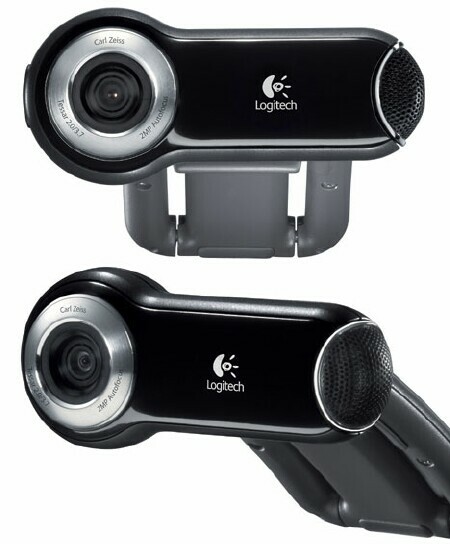 2nd - Quick capture button does pictures (2Megapixel) and video from low to HD 720p. 3rd - Video effects button, my favorite, gives you the options of changing to a cartoon avatar, add a nose or a crown on your head, or even how the overall screen is shaded. 5th - The webcam setting button if you want to make changes. 6th - Video applications button links like Logitech vid, sight speed, Skype, Corel, Movie maker, and Gmail. 7th and 8th - The Help button and the mute sound and No video buttons. I of course, had to put it to the test see what zeiss optics is all about recording video on the different settings on 2 different pc's - a new laptop(Vista) and a dinosaur from 2004(XP) - just to see how well it did. Video recording has settings from 480x600 to 1600x1200(30fps max). I was actually very impressed with the S-VGA and HD settings. The camera was recording it with no problem. It did very well with the background music and voices simultaneously, even when stationed up high. I recorded us shooting pool on all the settings and it handled very well on all the resolutions. At high speed movement it did fairly well. I did portrait and wide area to cover a pool table with ease. After you stop recording it gives you the option of uploading it to you tube, emailing it, or playing it. I also used it to upload video and it was very simple to put it on youtube. I used it for MSN/AOL chat and again was very happy with the webcam. I could use the video effect on the messengers with no problem - it was great! The Bang for your buck: I like the low profile aspect of it; I can pack it in my laptop bag without taking up much room. The stand it comes attached to gives you the option of putting it on the laptop/notebook or stand-alone. The webcam is light (6-7 Oz.) enough to hang from the ceiling (I’m sure the guys at Logitech didn’t make it for that, but I had to try it.) I love the video effect button which is great for us on the road and have young kids at home; I was able to talk to my son using the different avatars from a dinosaurs, shark, and clouds that helped keep him entertained while I talked to the family. Logitech makes it easy to set up and the avatars mimic your face movements, right down to the eyebrow movement. It made it more entertaining for me too. 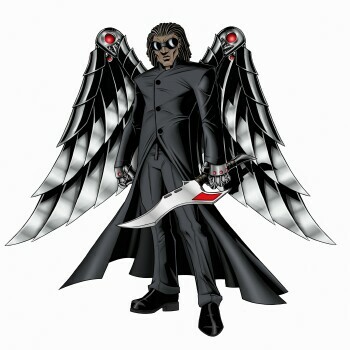 Now if only they made an Elmo avatar, I would be golden with the little guy! The Slack on the dollar: I was ok with the Built-in Mic sound recordings, but when I recorded loud sounds, like us breaking in the pool game or when I yelled at my brother “rack’em” the sound was blurred out some on the high part. One thing that I would like to suggest is that when I want to view recorded videos it always asked me to choose a program. Since, I don’t have WM Player, I had to manually select VLC every time, it would have been nice if it could remember my choices to view my videos; in all honestly, not major issues. 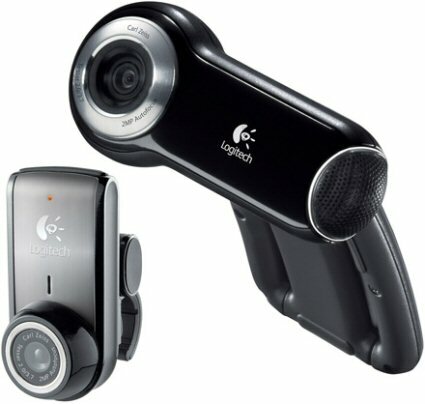 The Logitech Webcam Pro 9000 is a very good investment. It's able to handle a few scenarios from being on your desktop or laptop to being hung from the ceiling recording a large area. It can handle quick movement and has a good auto focus. I was very impressed with how user friendly it is. If that isn’t enough, it can record in 720p and look good. It's worth every penny. I also like that I don’t have to read the manual to use the majority of the functions. For all of that and the fact that it won't eat up ram like the older ones, I give this a TOV 5 of 5.